Samplers (the word comes from the French essamplaire meaning a work to be copied) were rough pieces of linen on which the stitcher practiced the various embroidery stitches. These swatches of material became her samples to act as a guide since she lacked books in which the stitches were drawn; hence the sampler word came into use. Over the centuries, the sampler evolved and today the art form ranges from the humble efforts of young children to the sophisticated and artistic work of more mature women. Why are they historically important? Needlework and other textiles are usually passed down through the female side of the family. They document bonds between women who are closely related but whose surnames are rarely the same. In a patrilineal society documenting these connections is especially meaningful not only to the families but also to collectors who search for clues about women’s roles in the family. 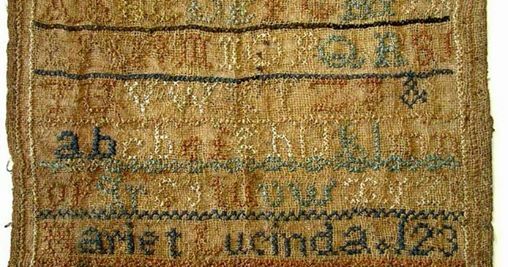 Needlework commemorates births and deaths and gives clues to those studying family genealogy. Samplers can provide the researcher with a concept of family and the person’s position in it. To find out more, please contact Carolyn Beacroft by email.